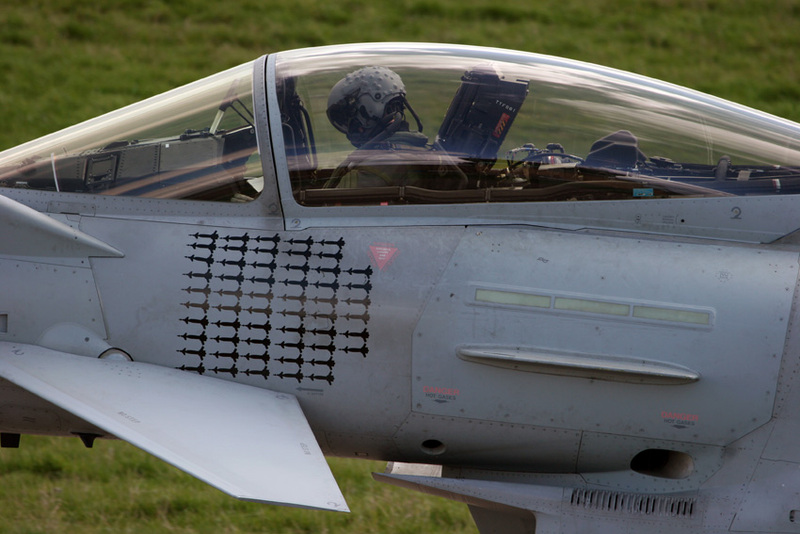 HUSH-KIT EXCLUSIVE: Does the RAF have faith in Typhoon? My exposure to Typhoon comes from RAF sources, some at the very highest level. I’m aware that what I’m hearing may be biased, but I’ve found the old adage that every fighter pilot believes his fighter is the best, simply isn’t true. Fighter pilots know the weaknesses of their own aircraft and the advantages that they have over their adversaries, these are basics for survival in combat. What I’m hearing is that in the air-to-air arena, especially with the HMS and Meteor, but even now, without the missile, the more experienced guys and girls on Typhoon would happily fly against anything and expect minimal losses. They are very, very confident. No one, on or off record, has said anything less than the superlative about Typhoon. I’ve been told that the aircraft is extremely powerful, with sufficient excess power to cope with planned upgrades. Hanging weapons on the jet makes little difference to its performance, while dropping them is imperceptible – except for the weapon symbol disappearing off the weapon screen. Typhoon has apparently been comprehensively ‘beaten’ in DACT by Rafale and Pakistani F-16s. Accepting this as fact, but taking it at face value is naïve. Without knowing the ‘cuffs’ imposed on those engagements it is difficult to assess their results with any real understanding. It is also the case that the RAF flies its Typhoons for airframe life, rather than extreme, ragged-edge-of-envelope performance. That’s not to say that such performance isn’t there, but it is telling that in regular training RAF pilots take Typhoon out to 9g. On the face of it, not such an impressive claim – USAF F-15A pilots were doing that in the 1980s – but Typhoon has the power and pilot support systems to go out to 9g and stay there, as a matter of course. And that’s when it’s being flown conservatively. I spoke at length with an officer who had previously been at the MoD and had worked hard to push Typhoon’s service-entry capability and lay the foundations for future development. 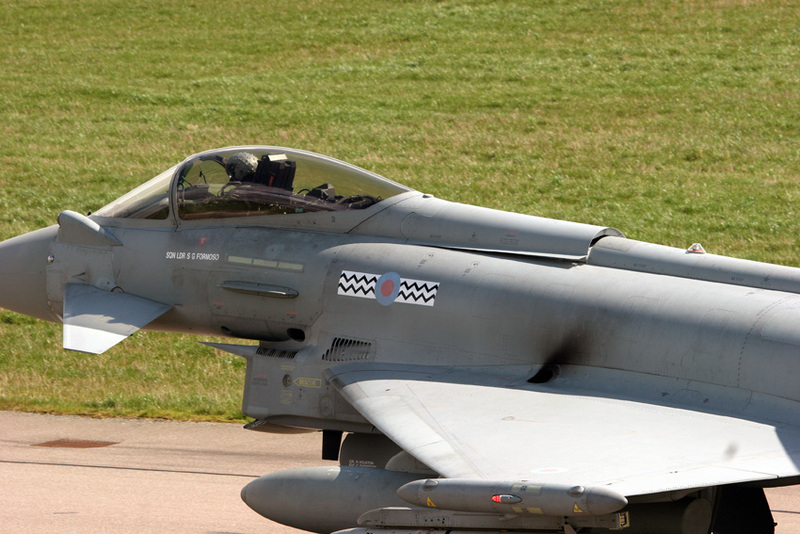 He said that over Libya, Typhoon had met and in many cases exceeded all RAF expectations. Many pundits see Libya as Typhoon simply dropping one type of bomb in a pretty limited way, but it was actually much more about Typhoon’s position within the information net and how it was able to facilitate just about everything in terms of the prosecution and, in some cases detection of fleeting targets. In many ways, Typhoon over Libya could be considered a BACN (Battlefield Airborne Communications Node) with bombs, supersonic performance and a formidable air-defence capability. I heard of one four-ship mission where three Tornados and a Typhoon bombed on GPS, taking out 17 targets simultaneously. The Typhoon then turned around and while he dropped his final two bombs, the pilot did bomb damage assessment with his TP. At the same time, his jet was providing enhanced EW protection to the entire package. The RAF has Typhoon set up to allow a single pilot to have full SA, while precision bombing and doing BDA in a hostile environment with a very real EM threat. In a mixed Tornado/Typhoon formation, threats detected by the Tornado’s systems – and the Tornado GR4 is no slouch when it comes to self-protection – were dismissed or reacted to based on what the Typhoon’s sensors were reporting, because the Typhoon system is considered so good. Typhoon’s radar also came into play looking for tankers in the busy, but large and sometimes very empty skies over the Med, and allowed the jet to deconflict traffic where communications, for whatever reason, had broken down. Tornado is a mature system, arguably close to the peak of its capability. Typhoon is still relatively early in its development cycle and all those mature Tornado capabilities are scheduled to come to Typhoon. Match those with the qualities displayed over Libya and a truly remarkable warplane is the result. On the other hand, I can’t see Typhoon winning any more major export orders. It’s hamstrung by the need to have all parties agree on major development decisions, although I feel that the programme, especially in terms of scheduled capability expansion, but also future upgrade and potential sales, is increasingly becoming a BAE Systems baby. I understand that scheduled upgrades are coming along as advertised, but budget controls pace. More money would see more capability very, very quickly. In the case of capability brought forwards for Ellamy, this was done through bringing schedule software ‘squirts’ forwards and pushing other less vital items back. The net result was that capability required immediately was delivered at no extra cost. Rafale vs Typhoon? Rafale is maturing fast and with AESA it’ll be favoured on the export market. Typhoon will be equally capable in a few years’ time and, I believe, ultimately the most capable ‘aluminium’ platform in the world. But as a programme it’s hamstrung by its international nature, which often restricts development to near glacial pace.